Here you will find all of your Concrete Floor Grinders & Shot Blaster needs. 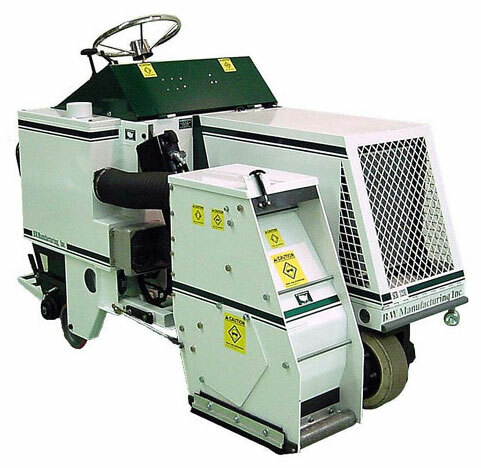 We carry multiple types of grinders such as floor grinders, hand angle grinders & shotblasters. If you can't find something that you're looking for, please give us a call at 1-800-227-8479. The SCB-1200 features a removable dust containment box with wheels for ease of dumping. One handed operation controls for raising and lowering heads, speed and shot control. A state of the art blast head design allowing you quick blast wheel changes and a feathered blasting edge, which enables each successive path to overlap without excessive penetration omitting the "striping effect". The finished surface is ideal for thin-set applications or for use with clear coatings along with the power to give you an aggressive shot blast profile when needed. The SCB 1200 comes equipped with the B-1200 Blast Head. The optional accessory attachments are the SC-1200 Scarifying Head and the DG-1225 Diamond Grinding Head complete with diamonds. After years of research, development and testing, B W Manufacturing, Inc. has produced the only mid-sized ride on shotblast/scarifying machine in the market today. The SCB-1200 gives you mobility and versatility by being able to switch back and forth between blasting, scarifying, and diamond grinding/polishing in just minutes. The SCB-1200 features a removable dust containment box with wheels for ease of dumping. One handed operation controls for raising and lowering heads, speed and shot control. A state of the art blast head design allowing you quick blast wheel changes and a feathered blasting edge, which enables each successive path to overlap without excessive penetration omitting the "striping effect". The finished surface is ideal for thin-set applications or for use with clear coatings along with the power to give you an aggressive shot blast profile when needed. Using the latest technology in EPA approved liquid cooled diesel engines and catalytic converter; you are far below any minimal emissions standards. With the use of state of the art components, compressors, electronic pulsation, hydraulics, and drives, the SCB-1200 is the most reliable and productive mid-sized surface preparation machine on the market today. Collector Capacity: 3.8 cubic ft. 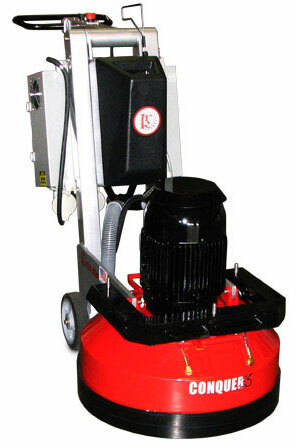 This is Onfloor 16 Floor Grinder / Scarifier / Sander comes complete with either the Red Diamond Concrete Plates OR The Carbide Scarifier blades. It runs on 115V and has a 16" head. ONFLOOR™ Technologies presents Onfloor 16™ — a revolutionary new tool in floor preparation. More than just a sander, Onfloor 16™ helps bring new life to concrete surfaces, decks and hardwood floors. Onfloor 16™ is powerful enough for demanding industrial jobs, yet light and simple enough for home use. And the exclusive patented design of Onfloor 16™ works to provide superior results with minimum effort. So not only will you be sanding like a pro in just a few minutes, you’ll be finished just as quickly. With Onfloor 16™, you can remove years of wear from just about any concrete surface. Our exclusive Red Diamond Concrete Plates are embedded with a coarse diamond grit that will quickly ready your floor for any coating application. And if your concrete floor has a coating that doesn't require removal, the Red Diamond Concrete Plates will abrade the surface and remove the gloss. Plus, when fitted with the powerful Carbide Scarifier Attachments, Onfloor 16™ helps remove most coatings and hard, brittle adhesives. The Carbide Scarifier blades are available for this machine as well. The DG-16 has the ability to grind within 1" of a vertical surface. The flexibility between grinding and polishing, and the virtually dust free operation when connected to BW Manufacturing's A-101 Pulse Vac makes the DG-16 an excellent addition to the surface preparation contractors line of equipment. 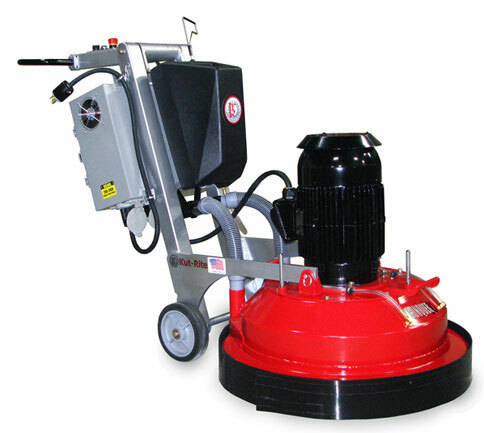 What sets the DG-16 Diamond Grinder/Polisher apart from all the others is the design, concept, and innovation. The DG-16 has a rubber mounted non-planetary grinding head that where down pressure controlled by spring pressure. With the combination of the wheels a floating, head and specially designed diamonds, you are able to grind or polis without scaring or gouging of the concrete, even on cracks and expansion joints. With the ease of diamond cutter and polishing pad installation and removal, the contractor won't lose production due to lengthy diamond tool changeovers. This machine is a 220 Volt Electric Unit. Side grind clearance to wall: 1"
Front grind clearance to wall: 6"
EDGEKutter is an extension grinding/polishing tool that was designed from the ground up to address the issue of operator fatigue. The EdgeKutter is available with a 6000 rpm grinder motor for prep and a 1750 rpm grinder motor for polishing. Concrete polishing is more than the next wave in surface treatment - it is a tidal wave that has impacted the flooring industry on a global scale. With this renaissance toward an economical, attractive, environmentally friendly and highly reflective (therefore energy saving) treatment of floor surfaces has come a myriad in styles of grinder/polishers and an equal array of companies who manufacture them. The final frontier in resurfacing existing floors, however, remains how to deal with the edges: how to get close enough to the wall; how to match the appearance of the edgework with the rest of the floor; how to eliminate the back-breaking work on hands and knees, with your nose too close to a dusty operation. Several devices have come on the market that serve as an extension tool for the standard angle grinder and polisher, but the challenge with these devices is how to make them agile enough that they allow the operator to feel and control the edging operation as effectively as he would if he were down on the floor in direct contact with the surface and the hand grinder. 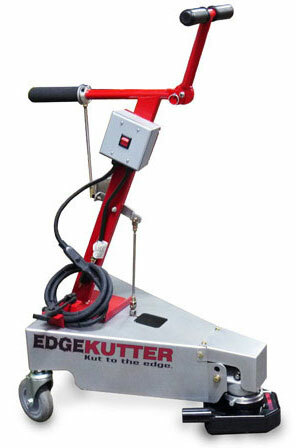 Kut-Rite's EDGEKutter™ is an extension tool that was designed from the ground up to address this issue. The tee handle on the EDGEKutter™ is ergonomically designed to allow the operator to use the machine from either side and can be adjusted to accommodate the height and comfort of any person. A second handle employs a throttle style grip that controls the pitch of the grinder in the same way an operator would if he had direct contact with the floor and gives him complete feel and control over the surface from a comfortable standing position. The Kut-Rite EDGEKutter™ easily adapts to any brand of hand grinder or polisher and comes equipped with a state of the art shroud and a rubber dust seal with a front hook/loop-fastened flap that can be pulled off for extremely close edging. A vacuum hose easily mounts to the shroud's dust port and passes through a bracket/draw latch assembly that keeps it (and the power cord) from getting in the way of the work. Rocker pivot suspension is employed at the rear axle to help the EdgeKutter™ maneuver over undulations in concrete to achieve the same flatness on the edges that is obtained by the large grinder in the central floor area. When powered up, the EDGEKutter™ effortlessly floats in infinite directions and turns on a dime, guided by two non-marking swivel casters. The complete grinder and guidance mechanism is safely and compactly tucked away under a cover and does not get in the way of the operator's feet during maneuvering. It is accurate enough to make touch ups in central areas that the larger machine might have left behind. In terms of safety, efficiency, accuracy and the elimination of worker fatigue, an investment in an EDGEKutter™ pays for itself many times over. 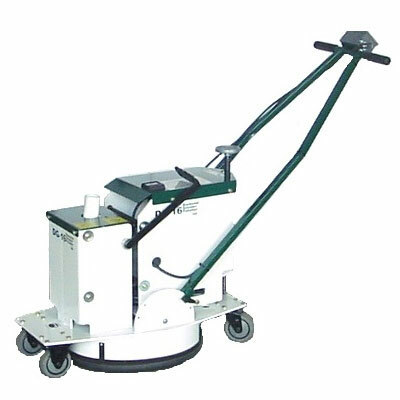 The Conquer20™ Grinder/Polisher is equipped with a sturdy, well balanced chassis and a powerful 5HP cast iron motor that provides the floor flattening capabilities of larger machines, while allowing the manueverability of a smaller foor print. 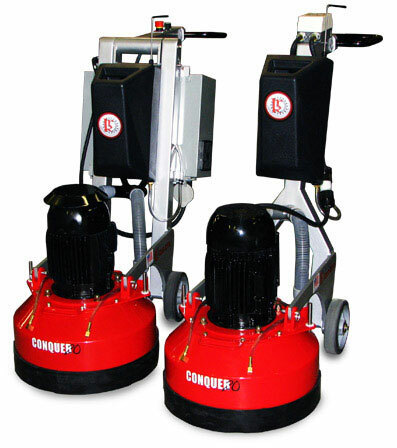 The Conquer20 is available in two models; the economical single speed version to fit the budget of most residential/light commercial contractors and a more versitile variable speed model for the larger contractor's that are needing versatility and have a heavy focus on polishing. The Conquer20 is fitted with the Magnetic Quick Disconnect (QD) Tooling for fast and easy tool changing and durability on the jobsite. The Conquer machines are equipped with a unique drive system for maximum torque. The Serpentine belt couple with the exclusive horse shoe tensioner provides up to 70% contact with the drive pulley and more than 50% contact with the spindle pulleys. What this translates to for the end user is NON-STOP POWER and TORQUE!! The belt is easily removed in minutes not hours. Kut-Rite's new Quick Disconnect tool mounting design is redefining how diamond tools are mounted. The QD system incorporates two locating pins, for precise tool positioning and the use of powerful neodymium rare earth "super magnets" to hold the tools in place. The result of this combination produces a tool system that allows quick and precise placing of tools for smooth running, holding power that virtually eliminates tool kick out during operation and extremely fast removal/insertion time. 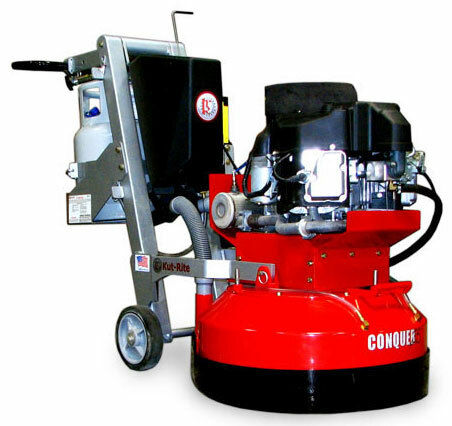 With nearly 500lbs of muscle, the Conquer25 Concrete Grinder/Polisher incorporates a dual phase 7.5hp motor and a 25" grinding path. The Conquer25 is more than just a machine, it's a system. The Conquer25 features the Magnetic Quick Disconnect (QD) tool mounting system and the user friendly "tilt back" design grinder head, for quick safe and easy tool changes. The Conquer25 is equipped with a unique drive system for maximum torque. The Serpentine belt provides up to 70% contact with the drive pulley and more than 50% contact with the spindle pullyes. What this translates to for the end user is NON-STOP Power and Torque!! The belt is easily removed in minutes not hours. The Conquer25 LP incorporates all of the Conquer series ergonomic designs that have become "fan favorites" for Conquer users. For instance; the Tilt Back Bowl that is incorporated into each and every Conquer series machine is also included in the Conquer25 LP! Thus, allowing the operator to safely and easily perform service and required tool (abrasive) changes. The adjustable throttle allows the operator to dial in the rpm to match the abrasive/substrate specific requirement. Just twist and pull and you can set the rpm to exactly the speed that is required. RPM is an important part of any grind/polish project and the Conquer25 LP is equipped with a digital tachometer that provides the exact engine rpm. There is a conversion chart on the handle that converts the engine speed to tools speed for precision grinding/polishing with specific tools. The Conquer25 LP incorporates an electronic clutch for precision engagement of torque to the grinding/polishing tools. This feature allows the system to start with zero torque and then engage or disengage with a flip of a switch. The Conquer25 LP is equipped with a unique drive system for maximum torque. The Serpentine belt provides up to 70% contact with the drive pulley and more than 50% contact with the spindle pullyes. What this translates to for the end user is NON-STOP Power and Torque!! The belt is easily removed in minutes not hours. The Conquer 30 VS features a "low profile edge" that can easily reach underneath shelving, cabinets, and other hard to reach places. This feature allows the large planetary machine to reach underneath shelving, cabinets, etc., and allows for closer edging by reducing the height of the machine bowl at the edge. The Conquer 30 is equipped with a unique drive system for maximum torque. The Serpentine belt provides up to 70% contact with the drive pulley and more than 50% contact with the spindle pullyes. What this translates to for the end user is NON-STOP Power and Torque!! The belt is easily removed in minutes not hours. 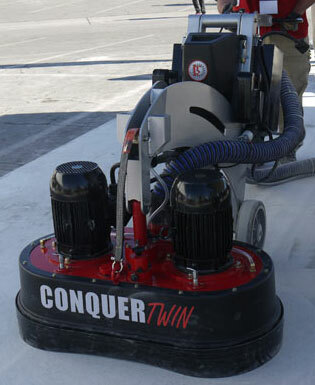 The Innovative Conquer Twin concept incorporates two passive planetary turntables with three abrasive drivers each. The turntables are positioned one behind the other (22" wide) or side by side (42" wide). The turntables counter-rotate and are synchronized with a gear system. The drivers and turntables are capable of rotating clockwise or counter clockwise and the machine incorporates three processing positions; 1) Planetary Mode, 2) Rotary Mode and 3) Hybrid Mode. The Conquer Twin grinding/polishing machine incorporates and combines two very different concepts into one unbelievable machine. 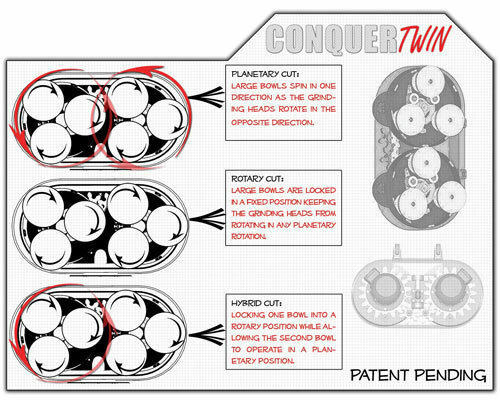 The Conquer Twin is equipped with a unique drive system for maximum torque. The Serpentine belt provides up to 70% contact with the drive pulley and more than 50% contact with the spindle pullyes. What this translates to for the end user is NON-STOP Power and Torque!! The belt is easily removed in minutes not hours.